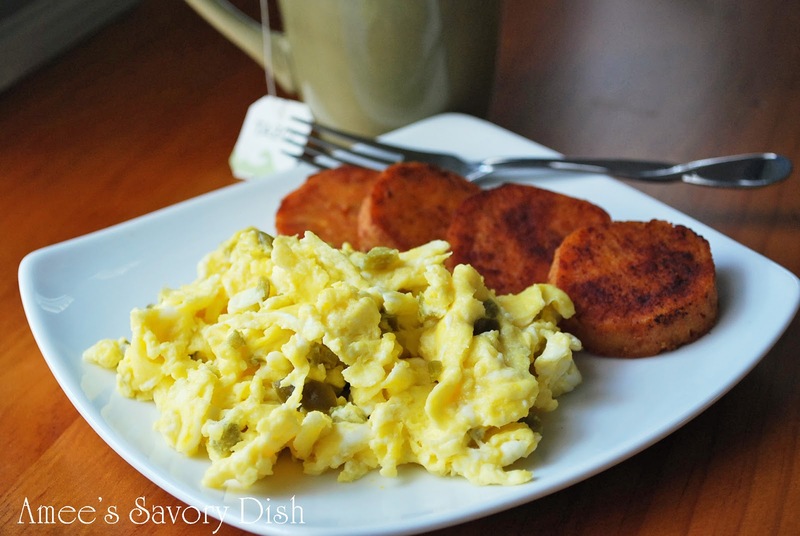 Jalapeno scrambled eggs have a nice kick of spice to jump start your day! Serve with pan-fried cinnamon sweet potatoes for healthy carbohydrates and delicious taste! This is a delicious and simple paleo breakfast recipe to kick-start your day. You get protein, a healthy fat, a green veggie, a good quality carbohydrate and the metabolism stimulating effects from cinnamon in this tasty breakfast meal. This easy healthy breakfast is great on its own, but for a complete meal, serve some fresh fruit along with it, like my Fresh Fruit Kabobs. Precook your sweet potatoes (whole) the night before, either in the microwave or oven. Wrap individually and store in the refrigerator. This way, in the morning you only have to slice and lightly brown them in the frying pan for fast cooking. Spicy scrambled eggs with cinnamon sweetened pan fried sweet potatoes. A delicious, quick and easy breakfast for one! In a small frying pan, heat coconut oil over medium heat. In another frying pan, heat bacon fat over medium heat. Place jalapenos in pan with bacon fat and saute until softened. Add eggs and cook until no longer runny. Sprinkle sliced sweet potatoes with cinnamon and cook in coconut oil about a minute each side or until lightly browned. n a small frying pan, heat coconut oil over medium heat. In another frying pan, heat bacon fat over medium heat. Add jalapenos and saute until softened. Add eggs and cook until no longer runny. Sprinkle sliced sweet potatoes with cinnamon and cook in coconut oil about a minute each side or until lightly browned. Wow!!! Love the breakfast.I can’t stand the taste of coconut oil, so I am possibly going to sub that with cooking spray, but I am definitely trying these. I love eggs and sweet potatoes. I didn’t use the jalapeño, but it was still absolutely delicious!